In a hammock by the ocean on a warm summer day with a tropical drink in one hand and good book in the other best describes my ideal book reading “happy place” escape, but then I wake up. In reality, I find myself sitting on the couch, my kids are playing video games and calling each other names. I slowly come out of my book coma to tell them to behave. My reality isn’t as exotic as I would like, but the book I just finished reading, Covering Home by Heidi McCahan successfully transported me to a foreign country with excitement and romance. Covering Home is a story about a woman sportscaster named Britt Bowen traveling to Japan in hopes of landing the ultimate interview with the mysterious All-Star American baseball pitcher, Caleb Scott. Britt has many questions to ask Caleb about his motive to play for a Japanese team as well as cover the big game. To Britt’s dismay, Caleb dislikes talking with the media which makes Britt’s interview efforts nearly impossible. Britt must be creative with her interviewing tactics by befriending Caleb and talking with him off the record. Trouble begins when Britt sees their friendship moving into something more while Caleb can’t differentiate between Britt his friend and Britt the sportscaster. Covering Home is an exciting baseball romance filled with curve balls, obstacles, line drives and shady pasts. You’ll find yourself cheering in the stands and pulling for the underdog. It’s a home run for any mom needing an escape from reality. 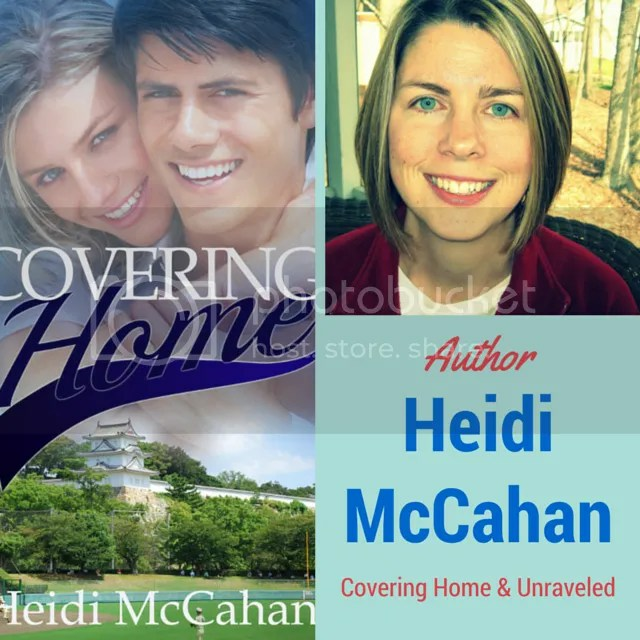 I had the opportunity to talk with Heidi McCahan, the author of Covering Home. Heidi understands the need to escape once in awhile as she is also a mother of 3 young boys ages 11, 8 and 5. I asked Heidi what she does to keep from getting overwhelmed as a mother and a writer, and she shared with me the Airplane Rule. “I can’t take credit for this as it was advice shared with me many times. It’s referred to as the ‘airplane rule’, which means take care of yourself first, then you’ll be equipped to care for those around you. For example, when you fly, the flight attendants always tell the parents traveling with young children that if the oxygen masks deploy, the adults must put theirs on first and then help the children. Moms often pour out into everyone else and then wonder why we feel so exhausted and depleted. Even when it feels impossible to carve out time, I think it’s essential that we find moments to rest and recharge. That might be a bubble bath, a quick run, coffee with a friend, a mani-pedi…It is perfectly acceptable to take time for yourself and I think women should make it a priority,” Heidi explained. I love the analogy of the Airplane Rule that I am going to challenge myself each week to carve out a little time for me like reading a book or meeting a friend to walk. I know that when I invest in a little me-time that I’m making myself a better, calmer, happier and more patient mom/person. I hope you will join me in this challenge. Heidi enjoys social media and connecting with her readers. Interested in a sneak peek of Heidi’s next novel before it’s in print and access to other exclusive content? Visit her website http://HeidiMcCahan.com and subscribe to her newsletter. I wish I was in a hammock at the beach right now. Think spring, right? Thanks for helping spread the word about Covering Home, Rachel. I appreciate it. Your welcome, Heidi. It was a wonderful book to read. Can’t wait for your next one! Yes, I need to find another book to escape into now. Ilove baseball! This sounds like it’s going ro be a great book! Thanks for the review!! Laura, if you love baseball you’ll love this book. It’s an exciting and romantic clean read. A mountain walk sounds wonderful, Jamie. Reading is definitely my escape 🙂 best one I know of. I love reading too. I enjoy finding new books to escape into. I read so much that sometimes, I end up checking a book out at the library and come to find out, I’ve read it before. Not one to re-read books, so back to the library I go to get another. With that said, I am always looking for new reads. This one will be a new pick for me. Linking up from Mom’s Small Victories. Michelle, Covering Home is a wonderful clean read. Be sure to check out the author’s other book, Unraveled. I usually escape into a book or my writing. With this freezing cold day in the triangle I wish I was in a hammock on the beach right now. You sound like me, a good book or writing. You’ll enjoy Covering Home. It is very well written.